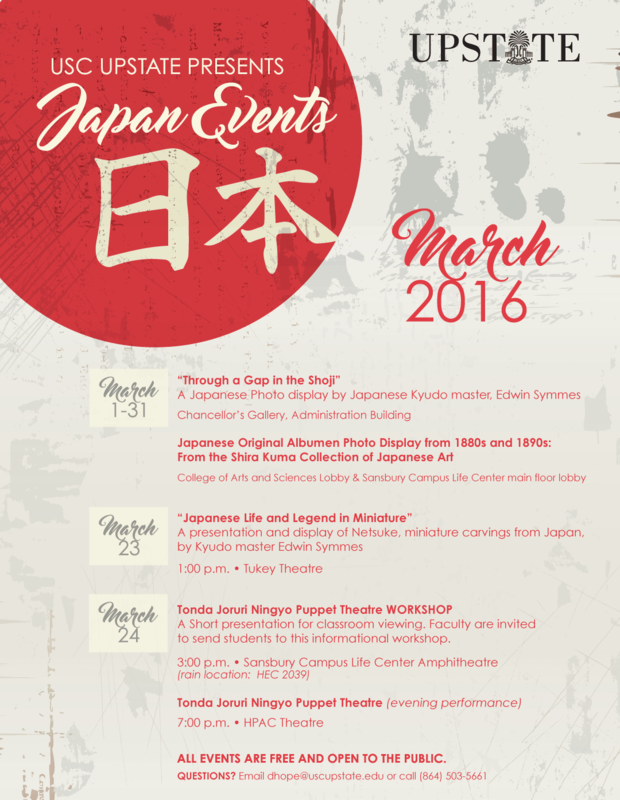 USC-Upstate Japan Events March 2016 for Upstate International Month include photography exhibit, netsuke presentation, bunraku traditional puppetry workshop and performance. Month-long: “Through a Gap in the Shoji” photo exhibit featuring original photography of Japan by Japanese Kyudo master Edwin Symmes. Chancellor’s Gallery located in the John C. Stockwell Administration Building. Month-long: Japanese Original Albumen Photo Display from 1880s and 1890s from the Shira Kuma Collection of Japanese Art. College of Arts and Sciences Lobby & Sansbury Campus Life Center main floor lobby. Wednesday March 23, 1pm: “Japanese Life and Legend in Miniature,” a presentation and display of Netsuke, miniature carvings from Japan, by Kyudo master Edwin Symmes. Tukey Theatre, located inside the Smith Building. Thursday, March 24, 7pm: Tonda Joruri Ningyo Puppet Theatre (evening performance), free and open to the public. Mature audiences only. HPAC Theatre.